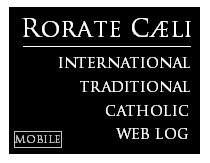 RORATE CÆLI: The 'Eucharistic' Rosary? It is perhaps no surprise and only natural that basic knowledge of the Church's traditional liturgical rites and pious devotions, let alone a real understanding of and sympathy for them, are scarcely to be found among adherents and advocates of the unprecedented and disastrous post-Vatican II construction of a new liturgy that was meant to replace the ancient liturgical rites of the Latin Church and thereby weaken or eliminate perennial Catholic eucharistic doctrine and theological emphases. Among the pious devotions for which they have no sympathy and understanding, we may count the old practice, formerly widespread but today all but fallen into desuetude, of praying the Holy Rosary of the Blessed Virgin Mary and meditating on its mysteries during Holy Mass. As noted here before, the current reigning Sovereign Pontiff earlier this year spoke of this devotional practice as if it were an obstacle to participation in the liturgy. Opposition to this devotion in the modern Church sometimes extends as far as virulent hatred, with one lay Catholic blogger expressing his personal opinion that praying the Rosary at Mass is an "execrable habit" and "a practice born of the rankest of ignorance, generally performed by people completely unschooled in the Faith." To Catholics living a hundred years ago, however, such sentiments would be not only unintelligible but indecent, irreverent, and prideful if not blasphemous and proximate to heresy. Not only was this devotion not thought to be an obstacle to participation in Mass, but the entire purpose of the devotion was to provide the laity with another way to enhance their participation in the liturgy. No doubt at least partly underlying the post-Vatican II antipathy toward the devotion is the widespread, lamentable inability or even refusal on the part of many Catholics to distinguish between the liturgical roles and functions of the priest and the laity at Mass and in all aspects of Catholic life. This blurring of ordained priesthood with the lay state -- a "laicising" of the priest and "clericalising" of the layman -- was behind, and helped by, the former intentional mistranslation of the Orate fratres (corrected in the current English translation of the Missal). Whereas the liturgy distinguishes between the oblation of the priest and the offerings of the laity at Mass -- "Orate frates: ut meum ac vestrum sacrificium acceptabile fiat apud Deum Patrem omnipotentem" [Pray, brethren, that my sacrifice and yours may be acceptable to God the Father Almighty] -- the former approved mistranslation of the Orate fratres erroneously spoke of "our sacrifice." Along with this dangerous blurring of lay and clerical identities is the notion that priest and laity together offer the Eucharistic Oblation, such that the efficacy of Holy Mass depends on the presence and participation of the laity (with some heretics even claiming it isn't the priest who confects the Sacrament, but the congregation together, with or without a "presider"). Entirely foreign to those who labor under that error is the fact that, while it is obviously better for all the Church when the lay faithful assist their priests in offering the Sacrifice, neither validity nor efficacy of the Mass are affected by the absence or presence of the laity, and a priest may celebrate Mass privately. Indeed, many Catholics today -- accustomed as they are to having the liturgy enacted before their eyes as on a stage, with the priest facing them and the words of the liturgy spoken in everyday, non-sacral vernaculars, with the sense of the sacred and of mystery more often than not missing from the celebration of Mass -- may never have noticed that for most of the Mass, the priest isn't talking to them, but to God the Father, and that it is to Him, not to them, that the priest presents the Victim. Most lamentably, for all the talk of "full, conscious, and active participation in the liturgy," the ethos and atmosphere of the post-Vatican II liturgy ironically often impedes rather than facilitates the full and conscious participation of the laity in Mass, leaving little space and opportunity for meditation and devotion, for thanksgiving and reflection. This is not the case with the traditional Mass, which is quiet and reverent or enhanced with serene and majestic chanted prayer, providing an atmosphere most conducive to meditation, prayer, and reflection and providing ample opportunity during the liturgy for communicants to prepare their souls to receive their Lord. But while the traditional Mass is prayed by the priest sotto voce and most of the responses are spoken by altar servers, the rubrics of the synthetic post-Vatican II Mass instruct the priest to pray so that all present may hear what he says (apart from a few prayers he is to say quietly), and repeatedly call on the laity to respond vocally -- to say nothing of the Rite of Peace which often functions as an intermission and social fellowship while the Victim waits on the altar for the Mass to continue, or the music and singing during Communion which often make it difficult if not impossible for an individual Catholic to pray and meditate and give thanks to Jesus for the Gift of Himself in the Blessed Sacrament. Again, the idea that the laity at Mass are there to offer a collective Sacrifice often elbows aside the layman's need to unite his individual sacrifice to the Sacrifice of Jesus offered at the hands of the priest. Or to put it another way, in the ethos of the post-Vatican II liturgy, the way the laity unite their sacrifices to the priest's Oblation is by saying the responses, listening to the Scripture readings and homily, joining in the singing, adding their "Amens" to the general intercessions and prayers of the priest, and following along with the words that the priest speaks as he prays -- in other words, saying and doing the same things that everyone else is saying and doing, at the time that they are saying and doing them. Completely foreign to this approach to the Church's public prayer is the historic approach to liturgy whereby each redeemed soul brings his particular offerings and crosses to join it to the priest's Eucharistic Sacrifice of Jesus on the Altar of the Cross, mysteriously made present on the altars of our churches. Traditionally, the liturgy has afforded the faithful a diversity of means by which they may participate in the Mass, whether following intently the prayers and actions in the sanctuary or chanting or silently offering one's own prayers and intentions and adding it to the priest's Oblation. The new liturgy, however, seems to be not very good at "multitasking," instead insisting that only one thing happen at a time, in sequential order. For all the innumerable prescribed options of the post-Vatican II liturgy, the option of allowing the priest to offer the Sacrifice of the Mass on our behalf while we offer our own sacrifices of prayer -- that is, letting the priest do the priest's work while the rest of us do whatever the Spirit has suited us or prompted us to do -- is somehow seen as impermissible. Our forefathers in the Faith, however, would never have imagined, nor dared to have suggested, that private meditations and devotions offered during Mass were illicit or were an impediment to participation in the liturgy of the Mass. How indeed could it be "execrable" to pray and meditate during Mass? 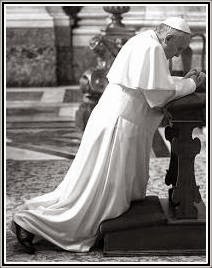 No wonder, then, that, regardless of the personal opinions and preferences of lay Catholics, liturgists, or even prelates, the Church has never proscribed, nor could ever proscribe, individual offering of prayers and devotions to the Eucharistic Victim during Mass. Completely unschooled in the Faith? 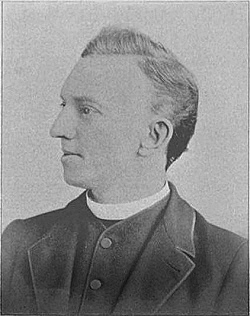 Certainly the devout and holy priest, Father Francis Xavier Lasance (1860-1946), author and editor of so many valuable devotional books and Missals, saw no conflict between the action of the liturgy and the praying of the Rosary during Mass. On the contrary, Father Lasance promoted and recommended this pious practice, which is called "the Eucharistic Rosary," a devotion which he included in "My Prayer-Book: Happiness in Goodness -- Reflections, Counsels, Prayers, and Devotions" (Nihil Obstat of Remy Lafort, censor librorum, Imprimatur of Archbishop John M. Farley of New York, 19 Sept. 1908), pp.334-343 -- significantly, found immediately after the text of the Ordo of the Mass. Also worth noting is that the Rosary, while a paraliturgical devotion, has a much older pedigree than the post-Vatican II liturgical rites. Why did he recommend the Eucharistic Rosary? Obviously not because he, so expert in the Faith, labored under "the rankest of ignorance" or was "completely unschooled in the Faith." Nor was Pope Pius XI, who bestowed upon Father Lasance a special blessing on 10 May 1927 in commendation of his devotional works, a rank ignoramus completely unschooled in the Faith. Rather, Father Lasance promoted this and like devotions because he was so well schooled in the Faith and could see things that so many modern Catholics have lost the ability to see, if they ever had the ability in the first place. Presented below is the Eucharistic Rosary from Father Lasance's devotional, with his introductory remarks excerpted. Admittedly (and sadly) it may be the case that many Catholics, never having heard the words of St. Paul from I Cor. 11:26-29 since they were deliberately excised from the post-Vatican II cycle of readings, may be offended by the Eucharistic Rosary's meditations on the Second and Third Sorrowful Mysteries. But that is all the more reason for them to contemplate these words. The Holy Rosary, on account of the meditations on the mysteries in the life of Our Lord and the Blessed Virgin, which we make while reciting it, is one of the most useful devotions while assisting at Mass, or, in connection with our visits to the Blessed Sacrament and the Hour of Adoration. The Eucharistic Rosary is especially recommended for this purpose, as it unites meditation on the sacred mysteries of the rosary with reflections on the life of our Lord in the Holy Eucharist. The rosary is one of the most admirable and beneficial devotions practised in the Catholic Church. Its method and design are stated to have been revealed to St. Dominic by the Blessed Virgin Mary, who admonished him to preach it with all the fervor of his soul as a singularly efficacious remedy for the overthrow of heresy and the extirpation of vice. And she said to him: "Thou shalt inform my people that it is a devotion most acceptable to my Son and to me." It is adapted alike to the learned and ignorant, to the cloister and the world, and to every capacity, the words being so easy that the most illiterate may learn them, and the mysteries so sublime as to afford matter of contemplation and entertainment to the highest intellects. No Christian could slight it without irreverence or neglect its frequent use without serious detriment to piety. The numerous indulgences attached to the recitation of the rosary make this form of devotion a powerful instrument for the relief of the poor souls in purgatory.
. . . If you persevere in this pious practice you will increase daily in love to Jesus Christ, and in imitation of the virtues of the Holy Family, Jesus, Mary, and Joseph. . . .
O Jesus, born of Thy Father from all eternity; filled with an incomprehensible love for men, Thou didst become man in the womb of the Blessed Virgin Mary through the operation of the Holy Ghost, humbling Thyself to such a degree as to take the form of a servant. The same charity hath prompted Thee to perpetuate, in the Eucharist, this mystery of annihilation and love, even to improve on it by becoming the food of our souls. Divine Jesus, we adore Thee in these unfathomable debasements, and we beg of Thee, through the intercession of Thy holy Mother, a deep and heartfelt humility. Divine Saviour, from the womb of Mary, wherein Thou didst become incarnate, Thou breathest forth sanctity into John the Baptist and upon the whole house of Elizabeth. From the Host wherein Thou dwellest, Thou spreadest all over the world the influence of Thy grace and Thy love throughout the whole Church. O divine Jesus, full of love and kindness, we adore Thee, and we beg of Thee, through the intercession of Thy holy Mother, perfect charity toward our neighbors. O King of kings! poor indeed, yet most lovely in the crib of Bethlehem, Thou callest the simple and the poor to be Thy first adorers: poorer and no less amiable to the eyes of faith in the sacrament of Thy love, Thou art still delighted to see around Thy person the humble and the little. O Jesus, in Thy destitution we adore Thee, to Whom belong all the treasures of the Godhead, and we beg of Thee, through the intercession of Thy holy Mother, detachment from the goods of this world. Lamb of God, Who takest away the sins of the world, Thou offerest Thyself with perfect obedience and love to Thy Father, through the hands of the high-priest, as the Victim that is to be immolated on the cross; every day also Thou offerest Thyself upon the altar by the hands of the priest, with the same obedience and love as our Victim always sacrificed and always living. O sweet Victim, we adore Thee and we beg of Thee, through the intercession of Thy holy Mother the spirit of obedience and sacrifice. O Jesus, Thou withdrawest and leavest Mary and Joseph in tears to do the work of Thy Father; but Thou fillest them with joy when they find Thee in the midst of the Doctors amazed at Thy knowledge and wisdom. Veiled in the Eucharist, Thou impartest there divine teachings, and Thou fillest with joy those who seek Thee with their whole heart. O hidden God! we adore Thee, and we beg of Thee, through the intercession of Thy holy Mother, the grace of seeking Thee with a lively and persevering faith in the sacrament of Thy love. Divine Saviour, under the weight of sorrow and sadness caused by our sins, Thou fallest, bathed in a sweat of blood, and Thou endurest a mortal agony. In the Blessed Sacrament, also, Thou art still more humbled and annihilated on account of our sins. We adore Thee and we compassionate Thy agony of suffering in the Garden of Gethsemani, as well as Thy agony of humiliation in the Eucharist, and we beg of Thee, through the intercession of Thy holy Mother, a heartfelt sorrow for our sins. O good Jesus! scourged and covered with wounds, the sins committed by men against the holy virtue of purity thus torture Thy innocent flesh; and in the Blessed Sacrament impure hearts insult Thee by their sacrilegious communions. O Thou bloody Victim, scourged at the pillar, patient Victim abused in the sacrament, we adore Thee and we beg of Thee, through the intercession of Thy holy Mother, the grace of mortifying our senses. O King of glory! crowned with thorns and proclaimed in derision king of the Jews by brutal soldiers who ignominiously spit upon Thy adorable face, Thou fallest a victim to the sins committed by pride; in the Blessed Sacrament also Thou bearest a crown of ignominy made up of the many acts of irreverence, contempt, hypocrisy, and vanity committed by Christians in Thy sanctuary. O loving King! overwhelmed with insults both in Thy passion and in the sacred Host, we adore Thee and we beg of Thee, through the intercession of Thy holy Mother, the grace of mortifying our self-love. Curses, outrages, ill-treatments, anguish of heart, sufferings of all kinds, nothing can, O dear Redeemer, alter the mildness and patience with which Thou carriest Thy heavy cross; with like sweetness and patience dost Thou bear in the long course of the ages, doubts, want of confidence, murmurs, insults, discouragement on the part of Thy children. O Jesus! we adore Thee carrying with love the cross prepared for Thee by Thy Father, and we beg of Thee, through the intercession of Thy holy Mother, patience in the trials of this life. O good and merciful Saviour! Thy love, more than iron nails, keeps Thee riveted to the cross whereon Thou atonest for our sins in the midst of unspeakable torments; we find Thee also riveted by the same love in the Sacrament of the Altar, continuing Thy sacrifice to the end of the ages in order to apply to us the fruits thereof. Sweet Lamb, perpetually immolated for us, we adore Thee, and we beg of Thee, through the intercession of Thy holy Mother, such a hatred of sin as will make us prefer the death of the body to the staining of the soul. O Christ Jesus! Thou comest forth glorious from the tomb, victorious over all infernal powers; henceforth sufferings and death have lost their empire over Thy glorious humanity. What a consolation for us to know that, though confined to the humble condition of Thy sacrament, Thou art in full possession of the life, joy, and glory of Thy resurrection! We adore Thee, O immortal King of ages, and we beg of Thee, through the intercession of Thy holy Mother, a lively and loving faith in Thy real and lifegiving presence in the Blessed Sacrament. O divine Saviour! Thy triumph in this mystery has reached its perfection! By raising Thyself up to heaven through Thy own power, Thou hast taken possession of Thy Kingdom, and Thou art seated at the right hand of Thy Father to be forever the joy of the angels and saints. Every day also without quitting Thy throne Thou comest upon our altars, under the form of bread, to bring us a foretaste of the heavenly beatitude. O Thou, the delight of pure souls, we adore Thee and we beg of Thee, through the intercession of Thy holy Mother, an ardent desire of possessing Thee here below under the eucharistic veils, and to possess Thee in heaven in the splendor of Thy glory. O Jesus, scarcely hadst Thou entered into Thy glory at the right hand of Thy Father, when Thou didst show Thy munificence by sending forth the Holy Spirit with His many and various gifts to Thy growing Church. From the Eucharist, as if from another heaven, wherein Thou hast set up Thy throne of love, Thou impartest to souls the spirit of life and strength, and Thou kindlest in them the fire of Thy divine charity. O Jesus, King in heaven, King also in the Eucharist, we adore Thee and we beg of Thee, through the intercession of Thy holy Mother, fidelity to grace in order to reap all the fruits produced in the souls of men by the gifts of the Holy Ghost. O Jesus, no longer canst Thou leave here below Thy blessed Mother; already she heareth Thy voice calling her, and amid the transports of an ineffable communion, love taketh away her soul from the land of exile. But her virginal body, like that of her divine Son, must not know corruption; Thou raisest her from the dead, and, brilliant as the sun, she soars on angels' wings to the seat of eternal glory. O Jesus, our resurrection and our life, we adore Thee and we pray that, through the intercession of Thy holy Mother, we may die in the arms of her who is also our own Mother, after having received in a fervent communion the pledge of our glorious resurrection. Divine Son of Mary, to make Thy holy Mother partaker of Thy own glory, Thou hast crowned her queen of heaven and earth and appointed her our advocate and the living channel of Thy graces. From the Eucharist not less than from heaven, Thou willest that every grace shall reach us through her maternal hands. O Jesus, we adore Thee in Thy unspeakable glory, of which Thou hast made Thy Mother partake with Thee, and we beg of Thee, through her intercession, a great confidence in her powerful protection and great earnestness in imitating her virtues; in particular her purity, humility, and fidelity to grace.